Andrew Dice Clay recently stopped by to record an episode of Tom Green's podcast, and its now available for download in the iTunes store. This week Tom has a conversation with the extremely hilarious Andrew Dice Clay. This entertaining and at times outrageous episode of Tom Green Radio dives deep into the world of the Dice man. If you think you knew Andrew Dice Clay think again. This episode covers a wide array of topics ranging from the media, to pop culture, comedy, showbiz, Donald Trump, and life according to Dice's rules. 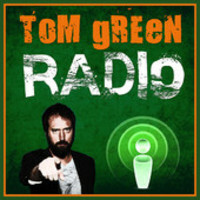 Tom Green has been broadcasting independently and in the mainstream for years and now brings his unique and sometimes twisted perspective to the world of podcasting. In this show, Tom will probe the minds of comedians, actors, authors, athletes, visionaries, scientists and more, all while inviting his listeners to call in and participate online.